Clearly iStamp: We have Winners! A huge thank you to all of the blog hoppers from this last Sunday's hop! We have some winners to announce. If your name is on the list, you will be emailed your prize by today. Congratulations! Congrats to all the winners!! See you next month! Congrats to the winners. Way to go Gail! Woohoo! I won the "Home is Where the Heart is"!! Love that image & sentiment..never a truer word was spoken!! Wow Thank you so much for the beautiful digi. I love them. Tuesday Tutorial: Make Paper with Digis and Word! 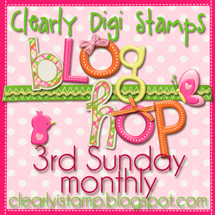 April Digi Day at Clear Dollar Stamps!